Rocky Mountain High-da-way is a two bedroom sanctuary with marvelous views of Colorado's cliffs. 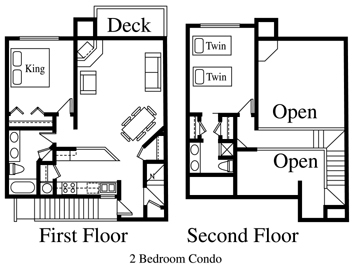 Rocky Mountain High-da-way, 312 Yankee Girl Court, is a deluxe 1125 sq ft two bedroom condominium with views of the San Juan National Forest from the living room, deck and master bedroom. This condominium sleeps six. The living room features a 55 inch TV, a DVD player and a wood burning fireplace. You must provide your own firewood available at the Country Store just down the road. The master bedroom has a king bed and a 32 inch flatscreen TV. The second bedroom also has a king bed and a 32 inch flatscreen TV. In additions there is a queen sized pullout couch in the living room. Linens, blankets and pillows are all provided.